Vespero has been plying the spaceways for about ten years now, though we here at Exposé have only encountered them through a few appearances on Fruits de Mer collections and singles. But their association with the RAIG label goes back much further, and if Lique Mekwas is any indication, there’s a lot going on that’s worth checking out. In broad terms, this Russian band is mining the same vein as classic Ozric Tentacles, spaced-out grooves that combine electronics and other instruments. 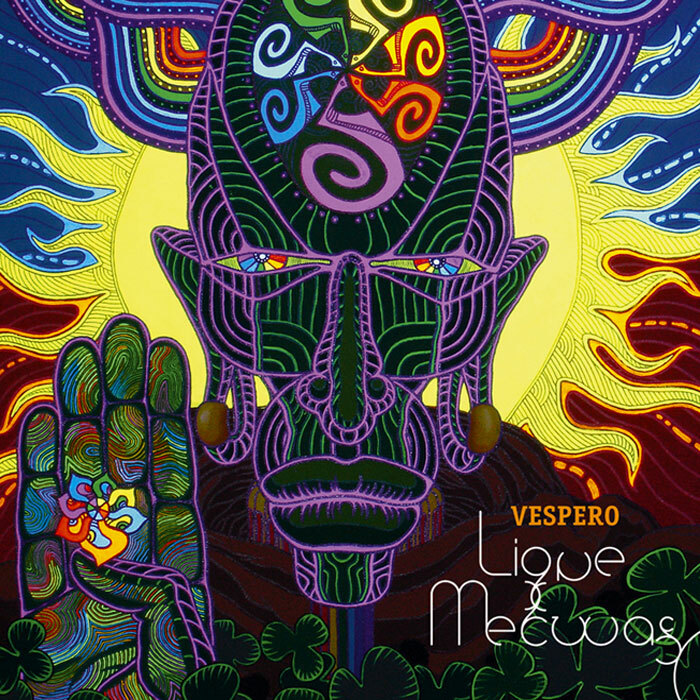 But Vespero has a lot going on that lift the music about mere grooving. We’re all used to great guitar playing, and that is certainly present here, wah-wah in force, echoes blazing, courtesy of Alexander Kuzovlev. The bass playing (Arkady Fedotov) is superb as well, whether laying down rhythmic lines or stepping out for a solo. Drumming (Ivan Fedotov) is outstanding too, both with inventive patterns and variations that hit accents with the other instruments. Alexey Klabukov’s keyboards are well done, with plenty of trippy analog work. Violin (Vitaly Borodin), sax (guest Pavel Alekseev), and percussion (Alexander Timakov) are three of the elements that really set this band apart. The violin may get a bit less time in the spotlight than the guitar, but Borodin’s solos are flashy and engaging, and the sax adds a jazzy touch that is welcome. The other real strength of this band is the dynamic flow of their arrangements. They know how long to ride a groove before switching it up, sometimes ramping up to double-time, sometimes dropping down to a more floating feel, varying the textures to build tension and release it. Lique Mekwas is great fun from start to finish, and I’m sure the band is a blast live — definitely deserving recognition outside their homeland.